In one sense, it may not sound like all that long. Then again, if you trace Nancy Metcalf's agenda throughout that decade, you'll likely feel as if you, by comparison, have been sitting on your hands. Ten years ago today, when her name was Nancy Meendering (pronounced MAIN-duh-ring), she was a 15-year-old with a passion for swimming. The previous fall, as a ninth-grader at Western Christian High School in Hull, she had played on the junior varsity team for a volleyball program that won the big-school title in a two-class Iowa state tournament. Would the fall of 1994 land her on the varsity? Could she make a difference for a team that was losing 6-foot 4-inch Lisa Reitsma, a future All-American at Nebraska? It mattered, but then again not so much. The hopes and dreams of 10 summers ago certainly didn't include this particular day. But this is it. This is the big day. This is when Nancy Metcalf, gracious as she was in 2000, when the U.S. Olympic team headed for Australia without her, expects to learn who'll be going to Athens, Greece, in August. Thursday was her day to meet with Toshi Yoshida, talking over all the things Yoshida hasn't been able to see on the court during his three years as head coach of the U.S. National Team. The coach certainly has no complaints there. "She's a scoring machine," said Yoshida, an assistant coach for the U.S. team that lost the bronze medal game in Sydney. "Whenever she goes in, she's just a scorer. I sometimes use her as a closer, toward the end of a game. That is extremely important for us." Metcalf, a lefthander, is an opposite side hitter, which means she generally plays the right side of the net, opposite the setter. The 18-player national team roster lists three players at this position and Yoshida will probably include no more than two among the 12 players on his Olympic squad. Less than three weeks ago, with 6-foot 7-inch Tayyiba Haneef nursing an ankle sprain, Metcalf stepped in as the starter and helped the U.S. team finish second to Italy at the Montreux Volley Masters tournament in Switzerland, one of the top events on the sport's international calendar each year. Then, just last week, with Yoshida staying home along with eight veteran players, six of them holdovers from the 2000 Olympic team, Metcalf led a runner-up team in scoring in six of their seven matches at the Pan American Cup in Tijuana, Mexico. "She's much stronger, a much better player than she was in 2000," said Yoshida. "Her maturity and knowledge and experience is so much better." While the Americans were losing last Saturday night's championship match to Cuba, the three-time defending Olympic champs, Nancy's sister, Kristi, was being married in Hull to fellow Dordt College student Bret Van Wyk, a native of Pella. A direct flight to Lincoln enabled Nancy and her husband, Jason Metcalf, a Lincoln native, to have dinner with the newlyweds Sunday night and see them off on their honeymoon. "I would've just gone back to Colorado Springs and had my interview Monday or Tuesday, but they let me fly home to see (Kristi and Bret)," said Nancy. "We watched the video and, of course, there were all kinds of tears." It was another tiny window in a whirlwind schedule that dates back, in some respects, to that first varsity season at Western Christian in the fall of 1994. Tom Van Den Bosch, architect of Western's volleyball tradition, didn't honestly know if he'd coach another player as formidable as Reitsma, who would be among the state volleyball hall of fame's second trio of inductees in 1999. Yet this promising sophomore, still torn between swimming and volleyball, was about to embark on a hall of fame career of her own. Metcalf, named to the hall of fame in 2002, helped Western win state titles in 1994 and 1995. Then, after a senior year in which she was unable to carry a young Western team past arch-rival Orange City Unity Christian in a dramatic regional title showdown, she played on the same team as Reitsma as a Nebraska freshman in 1996. "I don't think Nancy really started playing serious volleyball until she was in high school," said Van Den Bosch, now the head coach at Dordt. "She was pretty raw, but she was incredibly strong and talented. "The Olympic team? I would never have guessed that. Even going to Nebraska was quite a stretch because she didn't play a lot of club ball and didn't have a lot of exposure. Still, she was one of those girls that had incredible determination. When she set a goal, she just went after it." It didn't take long for that determination to pay dividends. Meendering -- she became Nancy Metcalf in March of 2001 -- worked her way into the rotation for highly regarded Nebraska as a true freshman. After that, she was a first-team All-American three times. Those final three seasons, though, were interrupted by a redshirt year in the fall of 2000, after her first year with the national team left her needing a bit of a break. There was also that disappointment over missing the Olympics, even though most of the team is customarily made up of post-graduate athletes. Nancy had traveled with the national team for much of the winter and spring of 2000. However, she didn't want to miss a rare opportunity when her Nebraska teammates traveled to China for a three-week spring tour. Mick Haley, the 2000 Olympic head coach and now the coach at USC, indicated the China trip wouldn't hurt her standing with the national team. However, when she returned, Haley and his staff had picked the 12 players and two alternates they would take to Sydney. "I was basically the last cut," said Metcalf, who notes that this year's Olympic delegation will include six alternates, not just two. Yoshida, a native of Japan with vast international coaching experience, tried to take away some of the sting. "I told her I thought we should keep in touch," he said. "Right after I took this job (head coach), I talked to her about coming over here (to Colorado Springs)." The pace has been dizzying ever since. In 2002, Metcalf's national team commitments stretched from early April through September and the world championships in Germany. She also traveled to Russia, Switzerland and Italy, to name a few. In 2003, it was much the same, although the season ran from May through mid-November and the World Cup tournament in Osaka, Japan, where the Americans finished third, becoming one of the first three teams to qualify for the 2004 Olympics. Just days after returning from Japan, she headed off to Italy, where she and four other national team members played professionally until early May. "I wanted them all here with me (in Colorado), but reality says 'no,' " said Yoshida. "It's a challenge for them, it's good for them. They make money out of it and they come back in shape." Playing for Despar Perugia, halfway between Rome and Florence, Metcalf had little time for sightseeing. "We got to spend a day in Rome with some friends," she said. "We had about five days off for Christmas, but by the time we found out it was too late to book travel to come home, the tickets were too expensive. So, we spent Christmas in Paris. It was amazing, but I'd rather have been home with my family." Thankfully, her husband, Jason Metcalf, has traveled with her all along, postponing plans to proceed with post-graduate studies in chiropractic medicine. The couple is buying a Lincoln townhouse, yet they're gone so much they are renting it out. Sunday, when they made it back to Lincoln for the first time since late April, they simply bunked at the home of Metcalf's mother. No sooner did she return from Italy than she was back in Colorado Springs, then jetting off to the Montreux tournament in Switzerland and then heading for Mexico. Now, providing she makes the Olympic team, she'll be gone for the rest of the summer. The U.S. team leaves next week for the World Grand Prix tournament, which runs from July 7 through Aug. 1. The Americans play their first week in Bangkok, Thailand, and their second week in Hong Kong. A third week of competition sends them to Rostock, Germany. Then, if they qualify, the top five teams join Italy, the host, for a final week in Reggio Calabria, Italy. "To be honest, all the travel does just kind of become routine," said Metcalf. "It doesn't sink in where all we're going. We don't get to see much of where we are. You don't realize what you've actually done." After the World Grand Prix, Yoshida and his squad will have just over a week of training on a Greek island before opening ceremonies in Athens on Friday, Aug. 13. The U.S. is ranked second in the world behind China, but those rankings take into account several factors, including the strength of a country's youth programs. In actuality, American teams have won just two medals in 10 tries since "women's indoor volleyball" became an Olympic sport in 1964. The U.S. won silver in Los Angeles in 1984 and bronze in Barcelona in 1992. "Our team is playing very, very well and we're definitely one of the top three or four teams in the world," said Metcalf. "We're definitely gaining ground this past quadrennial (since the 2000 Games). Toshi is an amazing coach. He knows more about the game than I could learn in a lifetime. But it's a different game in the States than it is overseas." In China or Cuba, for example, promising players are identified at an early age. "Some of these girls get pulled out at age 10 when they see any potential," said Metcalf. "We don't have that here. Our lives are more well-rounded." Instead, the American way is to pinpoint collegiate stars and eventually mold them into a cohesive team. 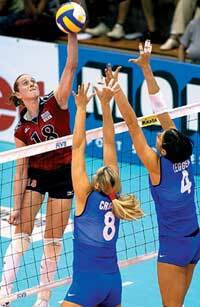 "We beat Cuba at the World Cup last year and we beat China at Montreux," said Metcalf. "So, yeah, I think our team has definitely come a long way." "In China, they're playing volleyball year-around since they're kids," said Yoshida. "We have athleticism here, but the skill level and ball control is where they're better than us. We have a long ways to go, but I don't know how long." How the Americans fare in Athens in one thing. Being there, to be sure, is quite another. While in Europe for the Montreux tournament, the U.S. team made a side trip to Greece, meeting with the American ambassador and taking a walk-through tour of the volleyball venue, a place called "Peace and Friendship Stadium." "It's very exciting to have the Olympics there," said Metcalf. "It's like going back to the roots of the Olympics." Quite an adventure for a girl from Northwest Iowa, the daughter of a custom cabinet maker and a nurse's aide. Quite an adventure, too, for Harry and Dee Meendering, who hope to be there, as well.